Perdana ParkCity Sdn Bhd, a subsidiary of the timber-based Samling group, will launch its maiden RM6 billion township project in Hanoi, Vietnam by July this year. Called ParkCity Hanoi, the project features townvillas, townhouses, semi-detached homes and bungalows, as well as condominiums and apartments, which will be built in 15 phases. It will comprise a commercial belt, a community clubhouse, a central park and international schools. The project will be a replica of Perdana ParkCity's on-going multi-billion ringgit Desa ParkCity township development in Bukit Menjalara, Kuala Lumpur, its group chief executive officer Lee Liam Chye told Business Times in an interview. "We didn't launch earlier because of the global financial crisis. While the property market in Vietnam (now) remains soft, we expect it to bounce back in the third quarter of this year. We are seeing pockets of recovery," Lee said. ParkCity Hanoi will be developed by The Vietnam International Township Development JSC (VIDC), in which Perdana ParkCity has a 59 per cent stake. Vietnam's Vinaconex-Hoang Thanh Urban Development and Investment JSC holds another 40 per cent in the joint venture, while the remaining 1 per cent is owned by a local Vietnamese businessman. Lee said Perdana ParkCity's contribution in the joint venture is to develop the properties, transfer its expertise and provide some funding. VIDC has signed a credit agreement with Vietinbank to provide US$45.7 million (RM150.81 million) for the project's two initial development phases. ParkCity Hanoi will cover 77.4ha at the junction of Le Van Luong and Le Trong Tan roads in Ha Dong district, about 13km from the city centre. "Our partners will assist us in marketing the products and dealing with the authorities. They are targeting the locals and expatriates in Vietnam. We are confident the project will generate good sales," he said. 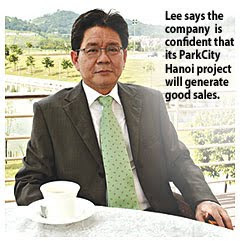 Lee added that ParkCity Hanoi will be a good platform for Perdana ParkCity to establish its brand internationally. Vietnam is Perdana ParkCity's first overseas venture. At its Extraordinary General Meeting (EGM) on 23 March 2010, Mah Sing Group Berhad’s shareholders voted unanimously to approve the bonus issue up to a maximum of 151,283,858 new ordinary shares of RM0.50 each on the basis of one Bonus share for every five existing ordinary shares of RM0.50 each. The bonus issue serves to reward Mah Sing’s existing shareholders for their continuous support and loyalty towards the growth of the Group. With a strong track record of profitability, clear expansion plans and an attractive dividend policy, the Group has strong institutional shareholdings, with more than 50% of their shares being held by reputable institutional investors. The bonus issue will allow the Group to increase its capital base and improve its liquidity by further enlarging the market capitalisation. The Group has landbank gross development value and unbilled sales of approximately RM6billion which provides earnings visibility for approximately 6 to 8 years. Despite the challenging economy, Mah Sing posted a RM94.3million net profit and sales of RM727million in year 2009, surpassing the initial target of RM453million by 1.6 times. “The sales momentum in 2010 has been boosted with the launch of new projects namely iParc@ Bukit Jelutong, iParc@Shah Alam and Perdana Residence 2 in Selayang as well as the preview for Garden Residence in Cyberjaya. The show units for Perdana Residence 2 has just been completed and unveiled to approximately 500 privileged guests on 13 March 2010. We received positive feedback on the designs, layout and finishes, and we are now eagerly looking forward to presenting the show village in Garden Residence. Comprising 10 show houses and a sales gallery, we target to open the show village to the public by the first half of 2010,” added Leong. DORSETT International Hotels & Resorts Sdn Bhd may own and manage a second hotel in Johor in the next three years. The proposed hotel, to be developed by a subsidiary of Malaysia Land Properties Sdn Bhd (Mayland) - Mayland Austin Sdn Bhd in Mount Austin, Johor, will however be positioned differently from the existing Dorsett Johor Hotel. "We are looking at a second hotel in Mount Austin within the Palazio development by Mayland," Dorsett Johor's resident manager Tengku Ahmad Faizal Tengku Mohamed told Business Times in an interview. "The hotel should be ready within the next three to four years. The positioning of the hotel has to be different, maybe only about five to 10 minutes from the existing Dorsett Johor (in Plentong)," he added. However, details on room inventory and cost of the new development have yet to be finalised. Dorsett International is owned by Hong Kong's Far East Consortium International Ltd (FEC). FEC deputy chairman and chief executive officer is Tan Sri David Chiu, the founder of Mayland. The Far East group now operates hotels in Hong Kong, China, Macau, Japan and Malaysia. It has confirmed a hotel opening in Singapore. Dorsett is also looking at growing its hotel portfolio in Malaysia. It was reported that Dorsett has been given RM500 million to either build or buy hotels in Malaysia. While it is eyeing to expand into the Klang Valley, it is also looking to have representations in Sabah, Pahang and Penang. It has confirmed of opening two hotels in the Klang Valley, one a 200-room business boutique hotel in Sri Hartamas, for an estimated RM100 million, and a three-star 300-room one in Cheras for between RM60 million and RM70 million. Apart from Dorsett Johor, the group owns and operates four other hotels in Malaysia, namely the Grand Dorsett Subang, the Dorsett Regency in Kuala Lumpur, the Grand Dorsett Labuan and the Maytower Hotel and Serviced Residences. DORSETT Johor Hotel may be a three-star property, but everything else, from its service culture to room facilities, would earn it an additional star or even two. The hotel is in fact comparable to other five-star properties in Kuala Lumpur. How so? For a start, the rooms are new and modern and its service standards impeccable. This 252-room hotel has a very lean staff to room ratio of 0.35, which is an enviable one, as every employee not only executes his or her job efficiently but also multitasks. Its 95 employees play their role in helping the hotel chalk-up a gross operating profit (GOP) of some 40-odd per cent. GOP is gross revenue from rooms, food and beverage, laundry or business centre minus cost of operations like wages, electricity and amenities. "We need quality staff and not an army," the hotel's, resident manager Tengku Ahmad Faizal Tengku Mohamed told Business Times when asked about its performance. This two-and-a-half-year-old hotel located in Plentong, Johor, expects a GOP of 43 per cent in the year ending March 2011, as it hits an average occupancy of 75 per cent and an average room revenue (ARR) of RM130. The jump in guest arrivals, from 65 per cent now, will be a result of an improving economy and the opening of the neighbouring Singapore casinos. By March 31, the company's GOP is expected to touch 40 per cent. "The economy has stabilised. Without a doubt, we can achieve 75 per cent occupancy," Tengku Ahmad said. "We plan to tap into the opening of the casinos in Singapore from those who want to gamble but prefer to stay here," he said, quoting tourists from Thailand as an example. He also expects Internet bookings to grow this year by up to a quarter of its bookings from about an eighth now. Accordingly, Tengku Ahmad is hopeful that the hotel will be able see the return on investment within seven years. The RM80 million hotel is owned by Hong Kong's Far East Consortium International Ltd. The hotel was originally part of an 11-block apartment called Prima Regency. One block comprising 47 units were converted into the hotel. The hotel's guests are two-thirds corporate-based and predominantly from Malaysia and Singapore. It also gets a good response from the US, Europe and Australia. It has some 50 rooms, which are on long-term lease and has a good 35 per cent of repeat guests. Tengku Ahmad's winning formula also comes from his principle of "One should sell what the guests/customers want and not sell what the vendor or the hotel wants to sell". Meanwhile, the hotel, which now shares the swimming pool with the apartment block, will have its own swimming pool within the next six months. It also plans to open a high-end spa. Dorsett Johor had two weeks ago won the Gems Awards for Best Three-Star Hotel in Johor, which was awarded by the Johor state government. KUALA LUMPUR: LFE Corp Bhd’s 51%-owned subsidiary Bestgate Development Sdn Bhd (BDSB) has entered into a sale and purchase agreement with Adept Development Sdn Bhd for the disposal of 116 pieces of freehold land for RM4.9mil cash. LFE Corp told Bursa Malaysia yesterday that the land was currently charged to AmBank (M) Bhd as security for the banking facilities granted to BDSB. “The land (prior to subdivision) was acquired on Jan 10, 2005 at an aggregate original investment cost of RM3.71mil,” it said in a statement. LFE Corp said the price was arrived at a willing buyer willing seller basis after taking into account the current prevailing market value based on another earlier lower offer on the land and the valuation on the land carried out by Messrs One Asia Property Consultants (PG) Sdn Bhd which valued the land at RM5mil. OILCORP Bhd’s unit D’Tiara Corp Sdn Bhd has agreed to sell property arm Magic Coast Sdn Bhd to Amanahraya Development Sdn Bhd for RM29 million. The sale was necessary to ensure that the joint-venture project, Amanahraya Corporate Tower & D’Tiara Hotel Suites, continues since Oilcorp would have difficulty in procuring end-financing due to its Practice Note 17 status. The project development cost is RM374.4 million and is expected to be completed by the end of this year. KUALA LUMPUR: Talam Corp Bhd subsidiary Galian Juta Sdn Bhd has entered into two sale and purchase agreements with Malaysian Allied Health Sciences Academy Sdn Bhd to dispose of two pieces of land for RM35.4mil. In a filing yesterday, Talam said the original cost of investment of the land was RM34.7mil. It added that the sale proceeds from the proposed disposal would be utilised to pare down the interest and principal to the entire loan facility granted by EON Bank Bhd to Galian Juta and the balance for its infrastructure cost and working capital.